This could raise some heckles and I’d like to say that I’m going to apologize in advance, but I’m not. I like home. I’ve mentioned it more than once during this blog challenge. I like so very many things about my home- my friends and family first, Target running a close second. I love driving (relatively) safely. I like personal space and politeness. I like finding any and everything that I want whenever I need or want it. I like crafting, which I’ve found hard to do in many of the countries I’ve lived in. But there are things that I’ve realized about my home since moving overseas. Not everyone likes America or Americans. In fact, a lot of people don’t. Now before you go spitting fire at the computer, slow down. Yes, I realize that many people are grateful to take our ‘help’ (read: money) when they’re in need. They’re also just as happy to turn back around and curse at us or make fun of us as soon as they’ve been helped. But we’ve kind of brought it on ourselves. We’re arrogant when we travel. We’re arrogant when we offer our help. We’re loud and fairly obnoxious and I have found myself, on more than one occasion, scoffing at some annoying American trying to get something done by being an overbearing bully. Or a passive-aggressive bully. Or a loud bully. Case in point- I landed in Bahrain after a weekend in Dubai and this large American family, wearing the exact same purple-sports-team jersey was in front of me. Apparently, the little boy left his pillow on the plane and they wouldn’t let him back on to get it. The mom started complaining LOUDLY about how ‘these people’ wouldn’t let her precious widdle boy on the plane to get his pillow. “I don’t understand why THEY won’t let him back on- it’s just a pillow!” she said, loudly. Well, guess what lady? No airline crew anywhere let’s you back on the plane after you’ve exited. I have learned that the hard way. But she was being so pushy, so angry, and did I mention loud, that I doubt anyone even tried to help her. They probably threw the pillow in the garbage… I would have. And that’s not it. You can find an American in a crowd anywhere- they are usually taking up the most space, making the most fuss. We tend to think we’re right- about anything. We tend to think we could fix any problem in any other country. We tend to think that people want us there… they do… as tourists. Then they want us to go home. I am not stereotyping all Americans, I promise. But it is easier to see the ridiculous arrogance of a people who think they know everything about everything when a large majority have never even left the country! Seriously y’all, people hate us. And I don’t really blame them in a lot of cases. BUT… on the other hand, I am not so blind as to the ‘wonders’ of each new country I live in either. I got some serious China Rage in Shanghai- did you seriously just hock a loogi out the window of your car, taxi driver? Oh, now you’re stopping to take a piss on the side of the road? CAN YOU PLEASE STOP TOUCHING ME WITH YOUR CART, GROCERY STORE LADY!!! I said OIG (Only in Guatemala) daily. I know there’s one for Kuwait but I can’t remember it. I can appreciate the differences of the cultures I’ve experienced but I know that each new group of people is not any more or less put together than the Americans… they just tend to keep it to themselves a little more. I am kind of half-and-half on this prompt. I think I’ve lived in enough places and gone through enough culture shock to see both sides of the coin. It’s possible if I had only lived in one place, I might feel differently. But now, we’ll never know. Another thing I love about home- The Awful Waffle! Next postSmile for the Camera! Is it true that you can pick out an American by their athletic shoes? So true that we can always pick out the obnoxious Americans because they stand out like sore thumbs. I don't know why I always feel embarrassed by their bad behaviour. 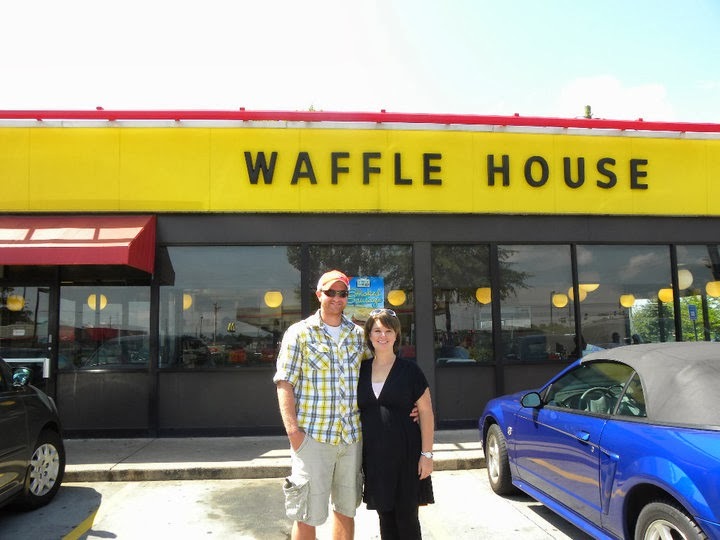 I could really go for some Awful Waffle now. I have heard that- if you don't want to look like an American tourist, don't wear sneakers out and about. I was really embarrassed to be standing near the loud woman with the purple on, especially because she was from the South. If anyone had tried to talk to me at that time, I think I might have affected a (very bad) English accent.